In December I briefly described a quick method for vectorizing pixels with the Live Trace feature in Adobe Illustrator. In this tutorial you'll take almost the same steps in order to convert a Photoshop Brush object to an Illustrator brush file. 1) You'll need a brush set file and load it in adobe photoshop. 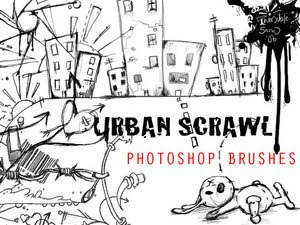 In this case I'll use an Urban Scrawl Brush set for Photoshop available here. 2) Load the brush (.arb) file in, by double click or dragging it into Photoshop. 3) Create a new document (white background, resolution - 200 ppi). 5)After selecting your shape click twice on the screen with the brush tool and save the document as jpeg or gif. Now comes the second part - Bringing the image in Adobe Illustrator and Vectorizing it. 6)Load Illustrator and create a new print document. 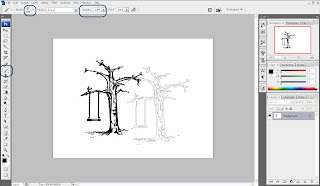 Then go to File>Place and choose the image that you created in photoshop. 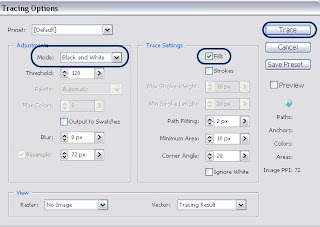 10) Choose the selection tool and delete the white areas that are not part of the object. You can experiment with the stroke color or fill, it's up to you and the object. 11) The last step is to save your vector as a brush file. Open your brush palette (F5) select your vector object and drag it into the bursh pallette. A "new brush" window will popup, select "New Art Brush, click OK and then name it. In the palette you can se other brushes, that are loaded in Illustrator by default. Delete them from the palette (don't worry they are not going to be removed) by selecting them and clicking on the trash can. 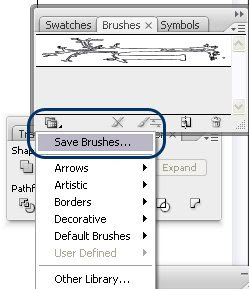 Leave only the brush that you've just created and go to Save Brushes... (look ath the image below) and name your file. Well that's it. I Hope I didn't shorten the process a lot. wow! u saved my life!! heheheh!! thx! This is the best and most easiest tutorial. Thanks. Well you saved me too. magnificent! this blog is loaded. we might need you around our group. keep in touch. Is the Live Trace only an option in new CS versions? I only have CS but am thinking of upgrading. Can I skip CS2 and go straight to CS3? Great tutorial, help a lot,can explain the 200 ppi in adobe photoshop? how to set it? picel, cm,or mm? Excellent and clear tutorial. Will save a lot of time! 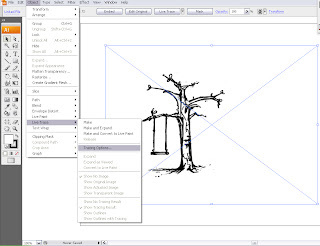 you can expand the traced object, use the white arrow tool and select a white area. Then go to select -> same fill color... and hit delete. all white areas should be gone. just make sure you don't have any other white areas you actually want on the canvas. what about the opposite? if you make brushes in illustrator, how do you bring them into photoshop? You can click "Ignore White" in the Live Trace dialog, so you don't have to delete it manually. Thank you for the tip Cheryl ! I was at the height of frustration with my project and about to give up - then I found this. Lifesaver!